Publication: O. Hirose et al. (2017) SPF-CellTracker: Tracking multiple cells with strongly-correlated moves using a spatial particle filter, IEEE/ACM Transactions on Computational Biology and Bioinformatics, PP(99):1-1. Award: Guillaume Lambard received a Best Poster Award at GTC Japan 2017(organized by NVIDIA). Award: Yumi Kawamura (Grad. student), Ryo Yoshida received the Research Encouragement Award at IIBMP2017. Member: Liu Chang has joined the Yoshida Lab. Publication: Ikebata et al. (2017) Bayesian molecular design with a chemical language model, Journal of Computer-Aided Molecular Design, 31(4):379-391. Member: Guo Zhongliang has joined to Yoshida Lab. Member: Stephen Wu has joined to Yoshida Lab. Dr. Stephen Wu�ｼ�ETH Zﾃｼrich�ｼ永s going to stay in ISM (Apr 16-19). Tokunaga had moved to Kyushu Institute of Technology, School of Computer Science and Systems Engineering as an Assoc. Prof..
Ikebata (Grad. Student) received JSBi Excellent Research Award and JSBi Best Presentation Award at IIBMP2014. Yumi Kawamura entered The Graduate University for Advanved Studies and joined Yoshida Lab. Yamashita (Grad. Student) received a doctoral degree in statistical science. Doctoral thesis: "Chemical structure modeling with kernel methods"
Dr. Jasmine Burguet�ｼ�INRA�ｼ永s going to stay in ISM (June 23-July 3), supported by JSPS. Yoshida stays in University of Oxford, Department of Statistics (Prof. Arnaud Doucet). Ikebata (Grad. Student) stays in University of Oxford, Department of Statistics (Prof. Arnaud Doucet). Yoshida is going to give a lecture at Open Lecture 2013 (ISM, Tokyo). Talk: Yoshida is going to speak at Cooperation of Computational Materials Science and Mathematics toward Smart Materials Design 竇｡ (JST Tokyo Headquarters. K's Gobancho). 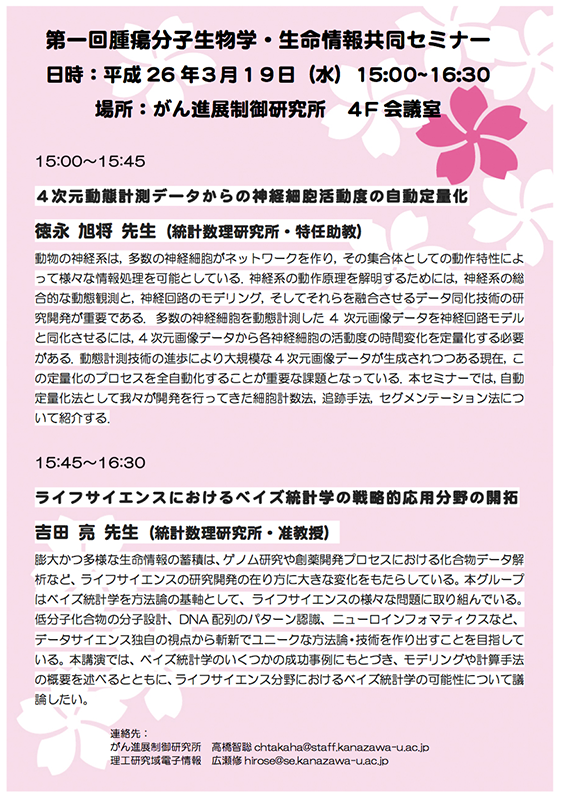 Talk: Yoshida is going to speak at Forum "Math-for-Industry" 2013 (Kyushu Univ.). Tokunaga (Project Assist. Prof.) received the Best Presentation Award at The 2013 Japanese Joint Statistical Meeting (Osaka Univ.). Talk: Ikebata (Grad. Student) and Yoshida made presentations at Joint Statistical Meeting 2013 (Montreal, Canada). Copyright, Ryo Yoshida All rights reserved.